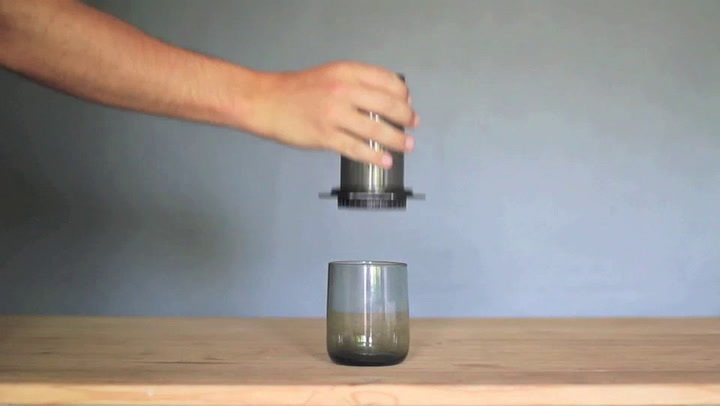 If coffee on the go sounds like your cup of java, the AeroPress will be right up your alley. Designed to take the complications out of coffee, the AeroPress combines the infusing properties of the French press with the pressure of the espresso. In the traditional method, the press is popped on top of a cup, grounds and water added, and stirred. 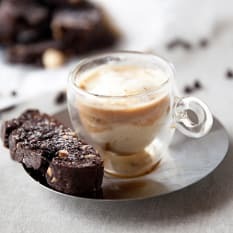 The coffee begins to drip into the cup immediately, along the same lines as a filter coffee machine, and then pressure is added to force the rest of the water through the grounds, as with espresso. In the inverted method, the whole apparatus is turned on its head, and grounds and water are added to the mixing chamber, with no drip-through. These are stirred for a few seconds for pre-infusion then, with a cup on the top, the entire thing is flipped over, and pressure is applied to force the water through the grounds. 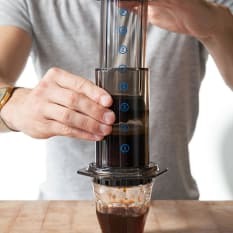 The same rules apply to AeroPress coffee as it does to filter and espresso: the water to ground coffee ratio changes according to what kind of coffee you like. Two scoops will make a double espresso, 1 Americano, depending on the amount of water you add. Pour water in, up to the 2 mark, then stir. If you're making Americanos (or have used more grounds for more coffees), then add more water. All parts dishwasher safe (except filter papers, which should be discarded when used). View more from Breakfast Collection, Coffee Collection, Specialty Coffee Makers, Aeropress. Best coffee I have ever had, about to order another one for my office. 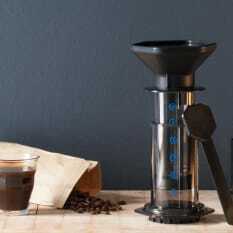 The AeroPress makes great coffee - I prefer it over our french press, drip coffee machine and espresso maker. If you grind your own beans it adds to a great coffee ritual. Great taste. Fast. Small. Easy to clean. I've just bought a second Aeropress to use at work because it makes such a great cup of coffee! Cleaning it is really easy too. I cannot wait to give this to my husband for Christmas. He always mutters about the coffee when we go away . This'll fix 'im. Have tried one myself, and it's very easy and efficient. What a good idea. It's very quick and easy to use and easy to clean, and it makes excellent coffee. There honestly isn't much more to say. Great product for any coffee lover. 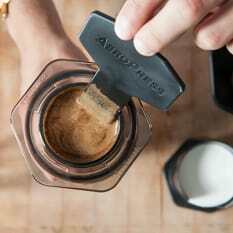 Why the buzz about AeroPress?